Merry Xmas you filthy animals. Big news amigos. Not only have we gone and booked our biggest American headliners ever. 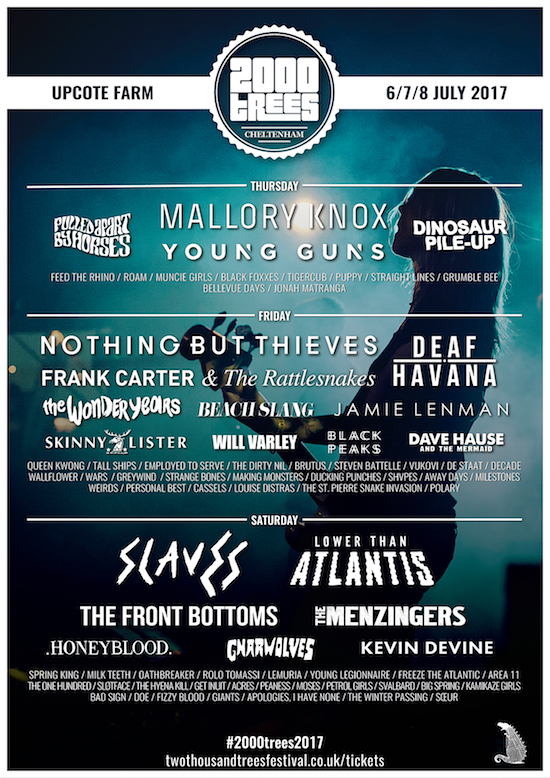 But we can now reveal that they’ll be headlining the Main Stage on the Thursday at 2000trees… So now you have Thursday, Friday and Saturday Main Stage headliners to get excited about…. Woo! This is the first time in 12 years we’ve opened the Main Stage on a Thursday & we can’t wait to spill the beans on who we’ve got flying in. If you don’t want to miss out, you need to pre register your ticket NOW to avoid dissapointment. But to make it easier we’re letting you Pay What You Want to register. So your ticket can be secured from as little as £1. But only until January 12th. 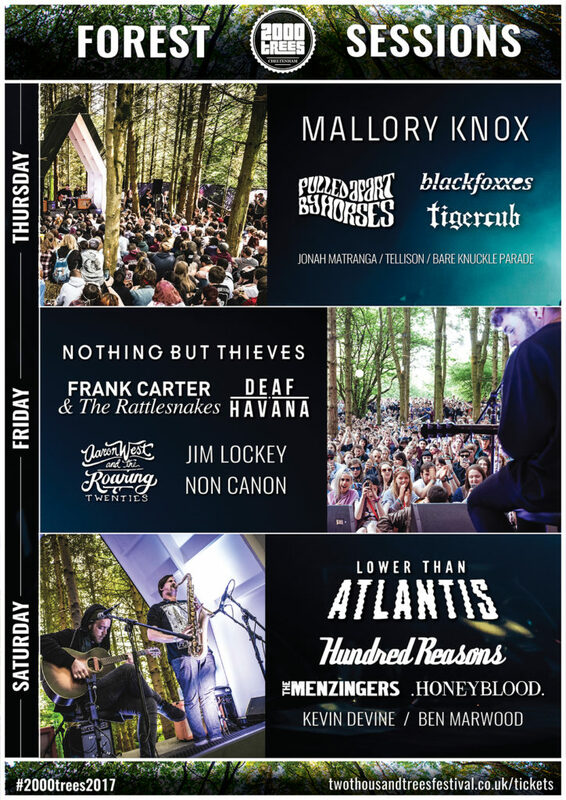 Remember, Thursday tickets are strictly limited, so if you want to be at 2000trees for the full 3 days and see the biggest, bestest line up we’ve ever had, you need to pre register your tickets below. Simply pay the difference between your pre-reg ticket & Early Bird ticket at any time in February. Early Bird tickets this year will be priced at £81 (2day) & £99 (3day). 2018 full price tickets will be £95 (2day) & £115 (3day) from Feb 1st. To find out who we’ve got lined up – Make sure you RSVP on our Facebook event here, then you definitely won’t miss the announcement coming in a few weeks time. Enjoy the rest of your festive eating/ drinking marathon & we’ll see you in 2018. ’tis gonna be the best year yet. *Guaranteed Early Bird priced tickets must be bought before March 1st 2018. **Zero booking fees if you buy in the first week of February (before midnight 11th Feb). ***Full refunds until March 1st if you change your mind. Terms. Must upgrade pre register tickets by March 1st to get Early Bird prices. After March 1st ticket price reverts to full price. Refunds on full weekend or day tickets only till March 1st. Pay what you want component is non refundable, unless a full ticket is purchased before March 1st. THIS COMPETITION IS NOW CLOSED… PLEASE SEE HERE FOR OUR NEXT COMPETITION LAUNCHING SOON. We’re over the moon to announce that we’ve gone and won another award at this year’s UK Festival awards in London (last Thursday). So much Wooooo. We bagged the Grassroots award (which let’s face it, is the best award anyway) & considering just how many amazing festivals there are in the UK right now, it’s super amazing that you guys voted for us and the judges obviously agreed. Simply pay the difference between your pre-reg ticket & an Early Bird ticket at any time in February. 2018 full price tickets will be £95 (2day) & £115 (3day) from Feb 1st. Reserve an Early Bird ticket now & save! We’re giving every band on our line up 2 tickets to give away to this year’s festival. That’s over 300 tickets to be won yo! So if you wanna win tickets for you & a mate then simply enter below before May 1st. 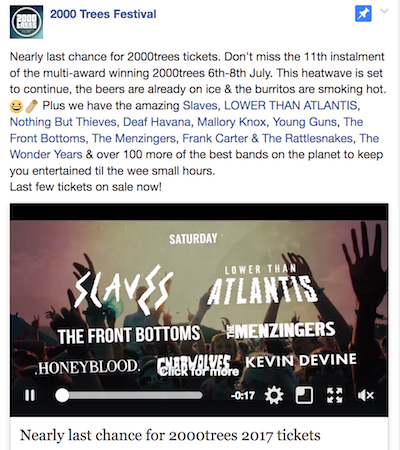 From which band or brand did you hear about this competition? To receive festival news, offers & ticket competitions sign up here. We would like to send you occasional news about 2000trees Festival. To join our mailing list, please enter your details above. You can unsubscribe at any time. If you do not select Sign me up you will still be entered into the competition but you won’t be entered into our mailing list & your data will be deleted after the closing date. LAST CHANCE FOR TICKETS…. COMPETITION. Howdy amigos – This hot weather has got everyone in a veritable ticket buying frenzy & tickets for this year’s festival are very nearly sold out. To get the word out to as many people as possible we’re doing 1 final Share & Like competition via Facebook to win 1 of 20 tickets. Simply answer 1 simple question via the link below, then Share our video on Facebook (details below). We’ve got 20 weekend tickets to give away so get sharing & good luck! Winners will be picked at random once you’ve entered via the link above. You’ll then find out as soon as you’ve completed the survey if you’ve won. 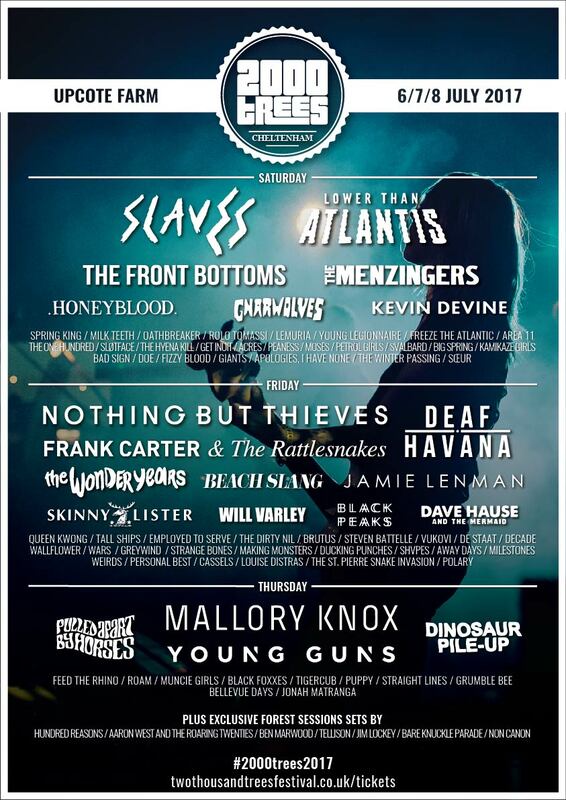 Hopefully see you at 2000trees in a couple of weeks. It all kicks off 6th of July… So don’t forget. Eeeeek! Hola – In 3 weeks today we open the gates to 2000trees & you can once again bask in the sunshine with an ice cold beverage, some of the best food on planet festival & of course watch your favourite, (or new favourite) bands. With that in mind check out our For Fans Of poster & Festival map below to help you decide which of the amazing bands you’ve got to see. For the unitiated, the For Fans Of poster is a list of all our bands, with a handy description of who they most sound like. Written by the bands themselves it’s supposed to give you a quick guide on who to check out at 2000trees, based on your musical preferences. Capiche? 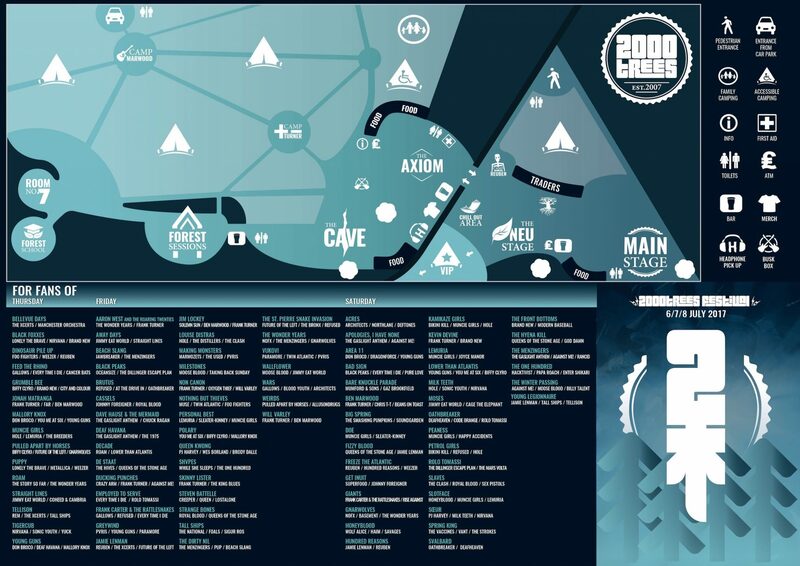 It also has a map so you can get your bearings & plan where to camp in a few weeks time. But before you check that out, don’t forget to have a ganders at our veggie vegan stalls below… (If you’re a meat eater check out our previous post here to see just some your food options so far). Beer & burrito competition reminder is right at the bottom of this post…? ?? We’ll see you in 3 weeks at Upcote Farm for the 11th edition of 2000trees. Whoop whooop. Make sure you’ve got your tickets – they are very close to selling out, don’t say we didn’t warn you! Keep an eye out for one of our new food trader kids on the 2000trees block – Taste Tibet. Named as one of the best budget street food/restaurants in Oxford by the Guardian, Taste Tibet has the ‘finest, freshest, most authentic Tibetan food this side of the Himalayas’. A hearty portion, full of delicious flavours to keep you going throughout 2000trees!! Next up, an all round people pleaser and local to the festival itself – Funky Falafel. How about No Horsing Around? Previously known as Cafe Razz, these guys are back and serving up their awesome veggie-vegan deliciousness! The perfect treat to keep you going through 2000trees – Look at all that veggie goodness!! ALSO, you don’t have to worry about not finding these guys in their brand spanking new horse box. Why not give ’em a go this year? These are just some of the amazing dedicated veggie-vegan food traders you can sample at 2000trees next month. HOWEVER, have no fear, the majority of traders will also have veggie options for you. Next week we’ll be showcasing some of the sweet treats that you can have for breakfast, dessert or if you get a case of the late night munchies. ? 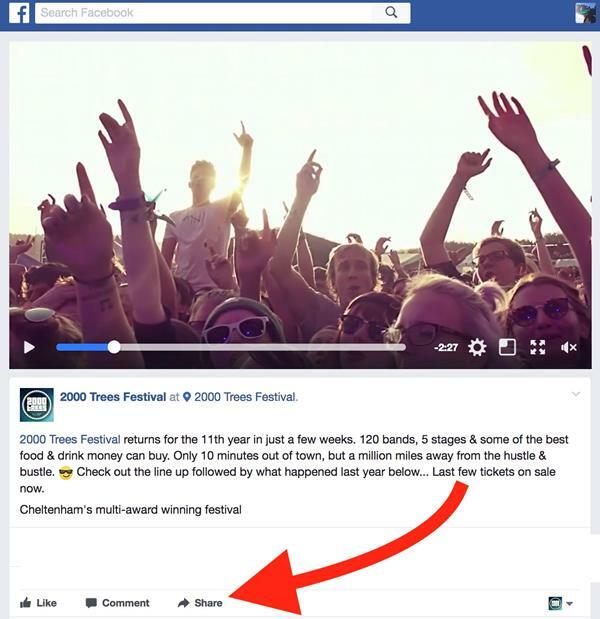 To get the world excited for 2000trees in 3 weeks time, share last year’s video below & 10 lucky people will win a case of ice cold Pistonhead lager & free burritos from Smokin Hot Tamales to enjoy at the festival. Prize = 1 x ice cold case of Pistonhead & 4 burritos to share with your mates (or eat all yourself). Over 18’s only for the booze obvs. To enter this week’s competition, simply share our latest video on Facebook HERE. Hola – Our clashfinder is finally here. In our defence it’s reyt hard to squeeze so much awesome into one clashfinder so apologies it’s taken us a while. You only have this long until the gates open at 2000trees. Click here or scroll down to grab your tickets before it’s too late peeps. Click it to supersize it. Enjoy. So, the announcement you’ve all been waiting for – This year’s Fancy dress theme (as voted for by you) is…. ?‍♀️?⚓️⛵️??? 2000trees on the high seas ?‍♀️?⚓️⛵️??? Read on for the rest of the news & don’t forget those tickets… We have this long until the gates open at 2000trees. – Click here or the timer below to grab yours before it’s too late. In today’s news… ICYMI, last night Frank Carter spilled the beans on our final bands & our extra special Forest sessions… (See below). 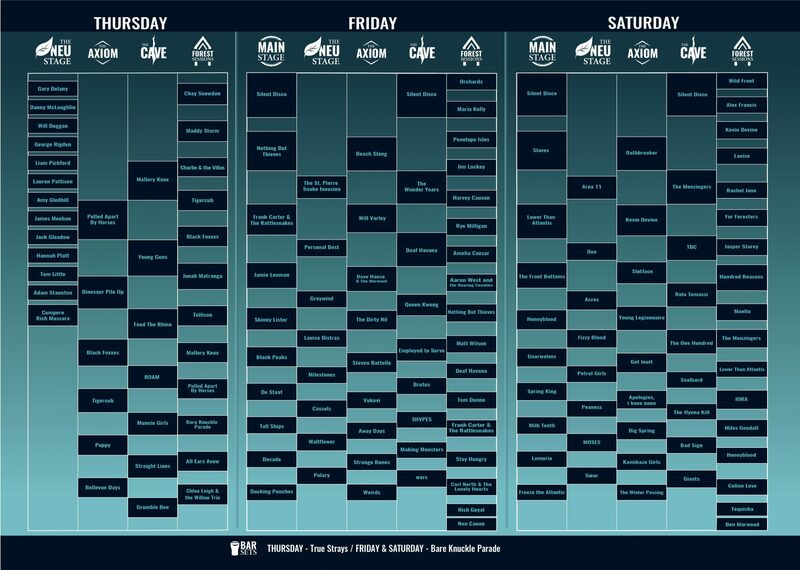 We’re so excited to see all these amazing bands in our amazing Forest with a cold beverage. It’s gonna be jam packed, so make sure you’ve got your tickets & get there early. The countdown to 2000trees is ON people… We have this long until the gates open at 2000trees. Still not got your tickets? – Click here or the timer below to grab yours before it’s too late.